On Wednesday, a tractor-trailer truck tipped over after taking a corner too fast on State Route 14. The crash left the highway completely blocked by the truck and also by 27 pounds of chicken manure, which had to be cleaned up by work crews before the semi could be right and the road could be reopened. 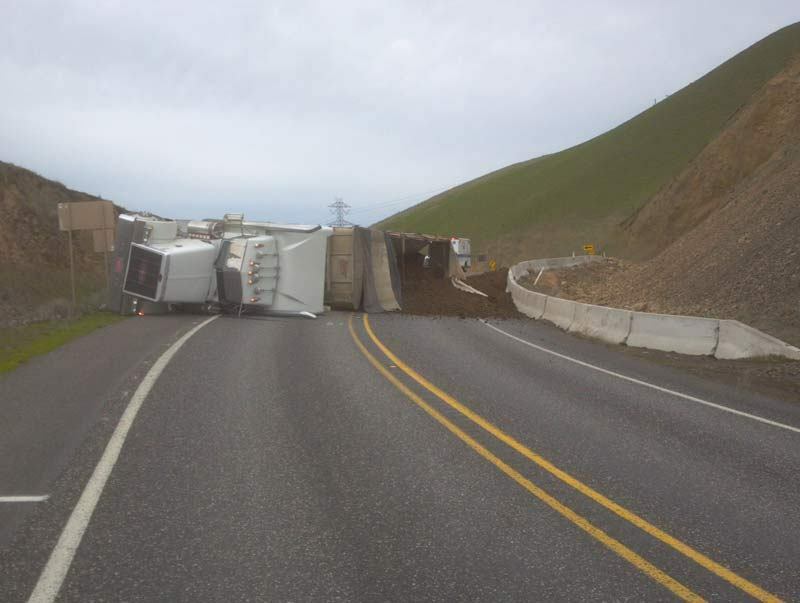 Even after the manure was hauled away, WSDOT workers had to pour sand onto the highway for traction and advise drivers to go slowly through the area because slippery manure had become embedded in the asphalt. Washington state’s farming and fishing industries have resulted in a variety of usual items covering our roadways after crashes. Semi-truck crashes through the years have covered our state’s roads in fish guts, apples, and 13 million bees, among other items. Across the country, truck crashes have necessitated emergency roundups of loose piglets, potatoes, Star Wars toys, sheep, donut glaze, 40,000 pounds of sausage, and more. Who is responsible for a truck’s load? Trucking law is a very complex area. It’s sometimes the case that one vehicle may have many different companies insuring it; the cab and trailer may be insured by different companies, or the person driving the truck may not have supervised its loading. When trucks lose their loads, resulting in backed up highways and possibly injured drivers, it can be difficult to figure out who’s going to pay for the resulting mess. Washington state law dictates that all motorists - not just truck drivers - are responsible for making sure their load is safely secured. In the event that an unsecured load turns into roadway debris and causes a crash, the trucker - as well as the company that employs him or her - can be held liable for the damages that result from such a collision. That’s why personal injury lawyers who handle trucking law have to work like investigators in order to protect their clients. Because damages in injury cases involving semi-trucks can be very high, the companies that insure trucks are willing to defend claims very aggressively. If you or your loved one has been injured in a case involving a semi-truck, it’s time to speak with a qualified trucking accident lawyer. The first days and weeks of these cases are often crucial for collecting evidence, so acting sooner is much better than acting later.